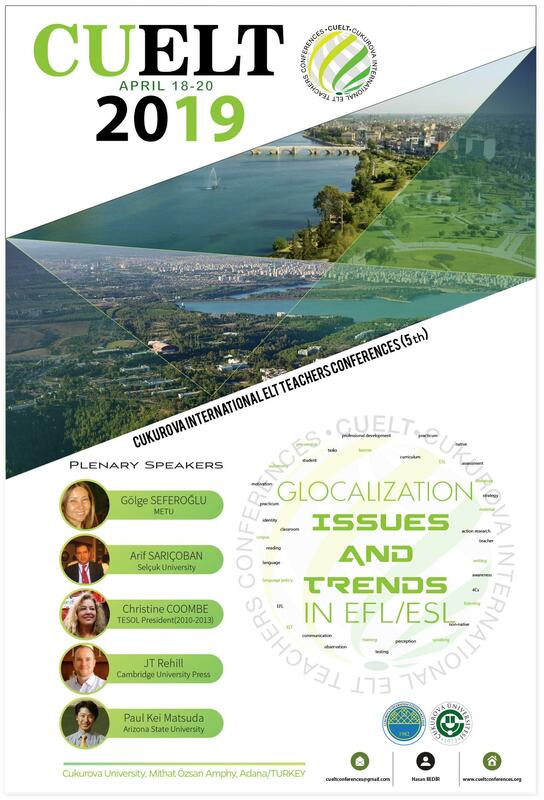 CUELT Conferences have become worldwide and well-attended ELT events in Turkey. Over 250 professionals and ELT teachers attended the CUELT 2018 conference, a three day-program of nearly 90 international and national presenters. With the national and international presenters, CUELT 2019 promises to be even more interesting and fruitful, as a three-day event with 5 plenary speakers, 80 paper presentations and 6 workshop sessions. It brings together a range of academics and practitioners to discuss new directions of research and discovery in English Language learning and teaching. As the main chair of CUELT Conferences, I would like to express our appreciation to Public Affairs, Embassy of the United States of America and Cambridge University Press, for the financial and logistic support they have provided. I thank to the other sponsors listed at the back cover of this booklet, which have made it possible to organize and carry out this international conference at Cukurova University. I also thank to all members of the Scientific Committee for their painstaking reviewing processes of the submitted abstracts and Organizing Committee for their sacrifice and contribution. I would also like to extend my sincere appreciation to our plenary speakers Prof. Dr. Gölge Seferoğlu, Prof. Dr. Arif Sarıçoban, Prof. Dr. Paul Kei Matsuda, Assist. Prof. Dr. Christine Coombe and J.T. Rehill. My heart-felt gratitude goes to our colleagues attending to the conferences and presenting their studies each year. If CUELT Conferences have become well-attended, these sequences of academic events deeply owe you. CUELT Conferences is an opportune time for all of us to renew and discuss innovations with other delegates coming from all over the world. I hope that all the participants will experience a rewarding and fruitful time while staying in Adana for CUELT 2019.